With the success of the superhero franchises (not to mention the legal requirements for Warner Brothers to retain film rights), it was only a matter of time before the most famous and archetypal superhero of all returned to the big screen. But as popular as he is, Superman seems to be the hero that's most difficult to get right. Audiences and comic fans seem very divided on how they like Krypton's last son depicted and the tremendous success of Richard Donner and Christopher Reeve's interpretation of the character in the late 70s looms over any who would make the attempt. Following their tremendous success reinventing Batman, Chris Nolan and screenwriter David Goyer took up the challenge, shepherding Man of Steel into narrative shape utilizing a similar approach to the one they took for Gotham's hero. Or course, since it's the summer, the project also has to fulfill the expectations for an action blockbuster, making the choice of director Zach Snyder, known for the distinctly larger-than-life style that infused 300 and Watchmen, seem logical. With the pressure on Warner Brothers to develop a joined continuity for the DC stable of heroes the same way Marvel has in their movies, everyone's been eager to see the results of this off-beat collaboration of filmmakers. Giving a plot summary almost seems redundant, since Superman has arguably the most famous origin story short of Jesus, with whom our hero has some clearly intentional parallels, but I'll proceed with it as a formality. 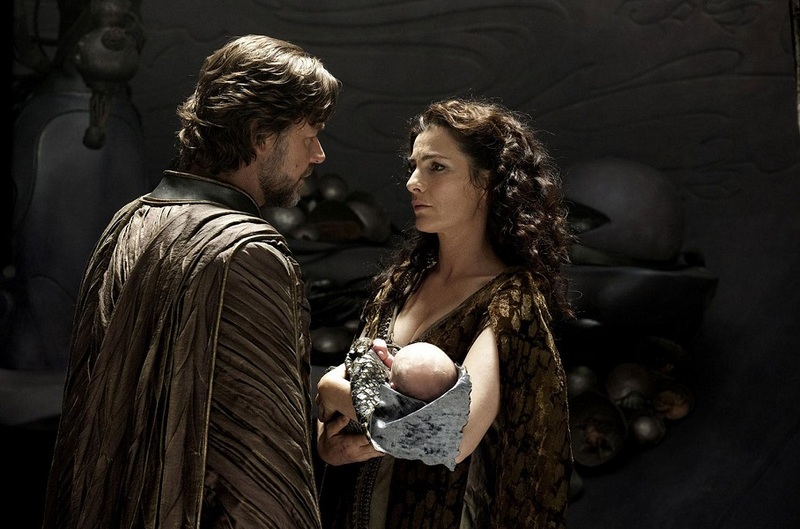 On the dying planet Krypton, Kryptonian scientist Jor-El (Russell Crowe) and his wife Lara (Ayelet Zurer) launch their infant son Kal-El in a space probe before the planet explodes. He lands in Kansas where he is discovered by Jonathan and Martha Kent and raised as Clark Kent (Henry Cavill). 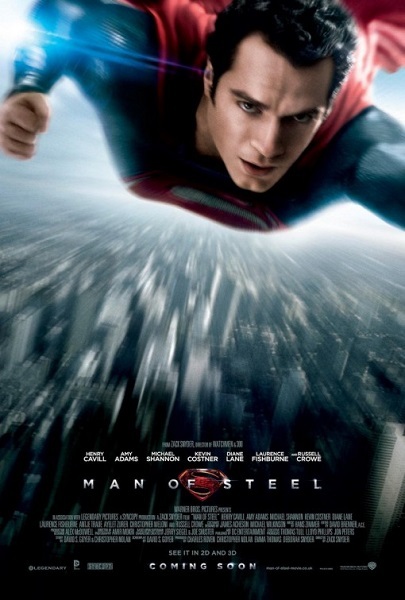 Possessing superhuman abilities that isolate him from those around him, Clark/Kal-El seeks out his extra-terrestrial origins, but he's not the only one trying to discover his identity, as intrepid reporter Lois Lane's (Amy Adams) encounter with Clark pushes her to investigate the wild stories of a superhuman rescuer that have sprung up in his wake. Meanwhile the crazed General Zod, imprisoned after a failed rebellion on Krypton during the planet's final hours, escapes his exile and heads for Earth, eager to capture Clark to realize his demented vision of Krypton reborn. 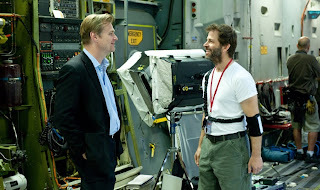 Though he's credited only as a producer and gets a story-by credit, one of the big talking points about the film has been Chris Nolan's involvement and how it has affected the style of the film. Nolan's Batman series was characterized by his efforts to take the sometimes fanciful elements of that character and world and cast them into an environment closer to reality. To that degree, The Dark Knight, arguably the best in that series, was Batman as viewed through the prism of a Michael Mann-style crime epic. A similar approach is taken by Goyer and Nolan here, with Man of Steel putting a greater emphasis on the science fiction aspects of the Superman mythos. Somehow over the years it's become easy to lose sight of the fact that Superman is indeed an alien visitor to Earth. By grounding the movie in that element, Man of Steel stays true to the elements of the comic book that we know but also gains an identity beyond that of a superhero flick. However, this brings up a point that I feel I must comment on though I will attempt to avoid getting ranty about it. There's a strange phenomenon springing up around filmgoers but especially comic-book fandom that has already been labeled somewhat misleadingly as the "Nolan effect." Anyway, the broad concept is that the realistic style that Nolan brought to Batman is influencing and ruining comic book films by forgoing the often colorfully fantastical nature of comic book storytelling. Thus if Nolan chooses a realistic and grounded style that attempts to justify some of the more outlandish elements of a comic property, it's immediate and conclusive proof that he hates comic books. While I do agree that Nolan's particular modus operandi is not necessarily applicable to all other superhero films, I find this conclusion suggests a solipsistic and not very mature view among comic fans that because a movie doesn't adopt the style they prefer that it somehow indicates a distaste for the source material. There are many different styles of comic books and thus logically many different styles for comic book movies. This mindset plays into the strange binary dynamic that arose last summer when many fans seemed to fall into opposing camps for Avengers and Dark Knight Rises, with each asserting that the other film represented all that was wrong with the genre. But the key thing to remember, beyond the important fact that Nolan isn't at the helm here, is that Nolan, Goyer and Snyder aren't writing a comic book. They are making a film, an adaptation of a comic series and that is a totally different beast. Part of the process of adaptation is trying out different styles and themes for a story, particularly if you're adapting something that had already been made into a film series before. Also, it's worth noting that they are making movies for an audience beyond comic book fans. Giving the Superman story a bit of a different spin may give something extra to filmgoers who are less familiar with the voluminous history of the original comic and will be coming to much of the material fresh. To that point, the familiar backstory is stirred up to serve two overarching themes: choice and trust. Not being as familiar with the Superman comic books (I was always more of a Marvel kid), I'm not sure how much has been invented for the film but as presented here, Krypton is a rigid society where each citizen's role is predetermined. Even before he becomes a symbol of truth, justice and the American way, the nature of his birth makes Superman an expression of the American ideals of freedom and self-determination, as Jor-El's actions put his son's ability to choose his destiny above what might serve the greater good of Krypton. 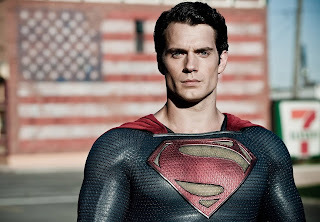 The film also adds the concept that a godlike-being might not inspire the adulation that Superman traditionally has. Clark's adoptive father warns him to keep his powers in check, even when he might be tempted to use them for good, based on a fear of how others will react. While Jor-El's hopes that Kal-El will inspire humanity to greatness, Jonathan offers a more pessimistic view of human nature, both of which contribute to Clark's conflicting values and loyalties. Many maintain that Superman should always be presented an absolute, a perfect paragon of goodness, decency and honesty, which is admirable but doesn't always leave much room for character development. 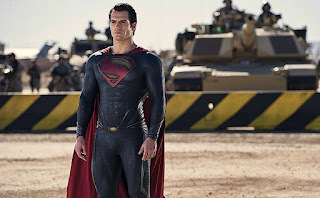 Man of Steel doesn't give us the moody "emo-Superman" that many assumed would result based on Nolan's involvement, but we do get a Superman who struggles with his alienation and frustration and eventually openly questions whether he should trust humanity. Giving such a superhuman character a recognizably human outlook and psychology only adds to our investment in his journey. Unfortunately while the overall story and character are well-conceived, David Goyer's script has some notable weaknesses. He is fine when writing larger-than-life characters such as Superman, Jor-El and Zod, but many of the supporting roles lack the little nuances of a life beyond the plot that would help them seem like real people. There's also a lot of clumsy dialogue and staging. Even Jor-El and Jonathan Kent's lofty speeches regarding Clark's potential and how society might react to his presence get repetitive to the point of annoyance. I will say Goyer does get points for the absolutely delightful exchange of dialogue that closes the film. Snyder has never been regarded as an actor's director and that becomes apparent, as many accomplished actors give some less-than-natural performances, something we'll get into shortly. Where he excels is his visual style and that is also apparent. Snyder chooses to give the film a more muted palette than one might expect for this character, but it's a decision that suits the sci-fi environment the film exists in, particularly with anything involving Krypton. The opening scenes set there are marvelously designed and realized, as is a spectacular moment of exposition as the history of Krypton's rise and fall (which includes a subtle jab at the financial cuts made to space exploration) is visualized through a liquid metal mural. Subtlety has never been one of Snyder's strong suits however, and audience members can have fun noting how Snyder frames key symbols just over our hero's shoulders, from a stained-glass rendering of Jesus to a cluster of American flags. Following the mixed reaction to Bryan Singer's more reflective Superman Returns seven years ago, there's seems to have been a mandate to increase the action and excitement levels here, another key reason for hiring Snyder as director. Unfortunately, the pendulum has swung too far the other way. As the plot ramps up, we get two extended action scenes of the nearly invulnerable Kryptonians punching each other through the air and blasting through buildings, spectacle that loses its ability to astonish when the combatants are both highly resistant to damage and obviously computer-generated. The focus becomes less on heroic behavior than on wreckage, turning off the story to engage in a human-scaled version of a Godzilla fight. The film feels much closer to the spirit of Superman when Clark is performing acts of heroism, something the third act of the movie could have used a lot more of. Of course central to the success of the movie will be the actor playing the intergalactic Boy Scout himself. Poor Henry Cavill has endured a career of near-misses with fame, having nearly been cast as Superman in a reboot that never got off the ground and being considered and eventually rejected for roles such as Edward Cullen, James Bond and Cedric Diggory in the Harry Potter series. In retrospect, it's probably for the best that he was passed over because he proves to be a fantastic Superman. The inevitable question becomes how he measures against Christopher Reeve, whose take on Superman/Clark Kent has generally been considered the definitive interpretation of the character and I can't say that's changed. That said, Cavill does avoid the trap that poor Brandon Routh was thrown into on Superman Returns, where he was given the impossible task of playing Reeves playing Superman. Allowed to make his own mark on the character, Cavill allows us to see Clark transition from youthful turmoil to the sheer joy of exalting in flight and finally to an otherworldly serenity and grace as Clark grows into his identity. The film does following the previously-set example of hiring big stars to play the small but pivotal roles of Kal-El/Clark's father figures. While Costner gives Jonathan Kent a nice sense of mid-Western working-class wisdom, the decision really pays off with the casting of Russell Crowe as Jor-El. Crowe doesn't slough the role off as a paycheck cameo but brings all of his presence and dignity to the show and makes Goyer's sometimes ostentatious dialogue positively sing. Another good decision is to expand on the role of Lois Lane in the story. While Lois has always been held up as a strong, proactive female character, there's always been something unsatisfying about how she's been used, at least in the films thus far. Her willful nature and drive to get the story no matter what the risk haven't been generally depicted as strong attributes but instead usually lead to her stumbling into danger and in need of rescue, suggesting a paternalistic reaction to women in the workforce. While she does need a bit of rescuing in this film, Lois gets to play a greater role in events and also displays a refreshing ability to see beyond her news story to grasp the bigger picture of what's going on. 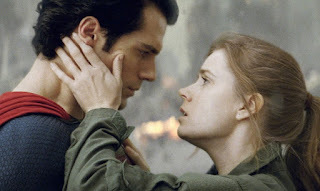 Her burgeoning romance with Superman feels a bit rushed but her actions throughout the film allow his affection for her to feel natural. Being a big fan of Amy Adams, I was eager to see what she brings to the role but she doesn't always seem comfortable, particularly when faced with some of Goyer's clunkier dialogue, such as the voice-overs of Lois' news copy. As Martha Kent, Diane Lane is easily the most ill-served by the script. While Jor-El and Jonathan get plenty of speeches in which they impart their values to Clark, we never really get to see Martha contribute to her son's viewpoint. This is particularly egregious since there's a perfect opportunity to do so during a scene where Clark confesses his reservations about humanity. Instead of using the scene to highlight how Martha's views about people might differ from her husband's, the scene is given to a priest character we've never met to that point. All Lane is left to do is fret about Clark, reiterate Jonathan's dialogue and get thrown around by Zod. That brings us to what is one of the more disappointing aspects of the film, its villain General Zod. On the page, Zod is one of the characters that Goyer gets right. The predetermination of Kryptonian society has instilled in Zod the drive to protect his people but has not provided the guidance as to the right way to do it, allowing him to be corrupted into a power-hungry and genocidal monster who has a deluded but righteous belief he is defending Krypton's essence. 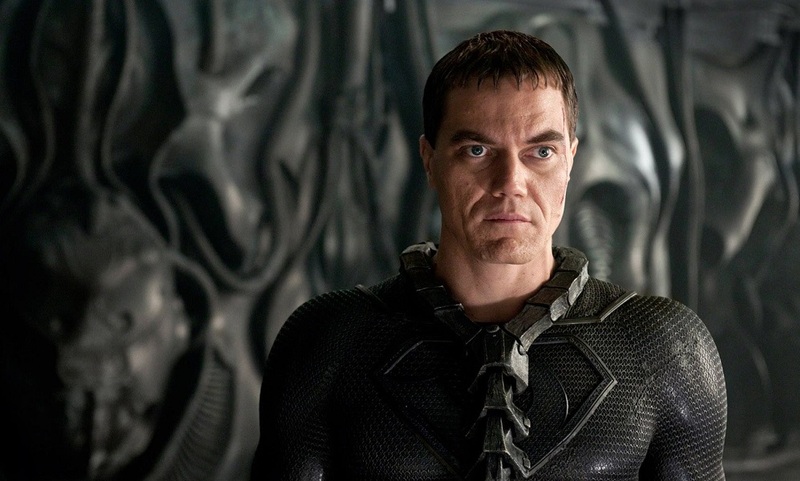 I tend to run hot and cold when it comes to Michael Shannon but at his best he is superb at suggesting a barely contained instability and madness, qualities that would suggest he's an ideal choice for the megalomaniacal general. However, Shannon's most effective when giving naturalistic performances and that's a skill not really suited to the kind of story-telling presented here, which usually relies on bigger-than-life characterizations. As a result, Shannon seems awkwardly self-conscious, like a big star trying their hand at Shakespeare for the first time. As for the supporting cast, Ayelet Zurer offers a strong presence in her small role as Kal-El's Kryptonian mother and Harry Lennix and Christopher Meloni represent the macho, skeptical military mentality well. Richard Schiff's bit part as a scientist and exposition-provider seems almost an afterthought and Laurence Fishburne seems a bit too calm and measured as Daily Planet editor Perry White. Battlestar Galactica fans also might get a thrill from the brief onscreen reunion of Helo and Gaeta... I mean Tahmoh Penikett and Alessandro Juliani. Special kudos must go to Hans Zimmer's score. Another symbol of this production breaking away from the franchise's established history is the wise decision to not reuse John Williams' iconic Superman theme. Instead Zimmer provides something a bit more robust than the two-note motif he created for Nolan's Batman. His new fanfare is best expressed in his end credits theme, which provides a beautiful musical metaphor for Superman's journey in the way that it starts with a lonely, melancholy piano melody before building and soaring into a percussive, propulsive anthem. It sends you out of the theater pumped and a bit more eager to forgive the film's flaws. And I can overlook those stumbles because at its heart, Man of Steel does justice to what Superman is really about. When Superman notes that what appears to be an 'S' on his outfit is actually a Kryptonian symbol for hope, it really speaks to Superman's most basic idea. Superman represents not only the hopes of his parents that he will make a better world, not only the hopes of the innocent facing death and praying for salvation, but the hope that every person can find in themselves the kind of courage, decency and heart that he exemplifies through his deeds. Throughout the film, virtually all of the characters, from Lois to Perry White, have their moment to show bravery and compassion in the most dire of situations and offer us the hope that we might be able to do the same. Man of Steel may stumble, it may fall but it also keeps us believing that a man can fly. I've decided to keep the spoiler section separate, so you can view thoughts on some of the crucial and controversial plot developments in the film's third act right here. First movies in franchises usually aren’t the best, which at least has me hopeful for the next installments. Good review Tim. Overall this one makes me pretty hopeful as well. I think the sci-fi flavor they focused on opens them up to use some of the more cosmic elements of the Superman mythos we haven't gotten to see onscreen yet, like Brainiac. As recent history shows, generally with the origin story out of the way the second movie is where these franchises find their feet... or in this case, take flight.